Coach may have been the designer bag on the arms of all the popular girls in high school, but it’s since gotten an edge. Selena Gomez and James Franco are currently repping the brand, which has empowering messages in its leather totes and sells its fair share of moto-inspired clothing as well as classic purses. And today, the more badass side of the brand was everywhere backstage before its runway show for spring/summer 2018—specifically, the hairstyle worn by all the models. When I first saw it, I figured they weren’t ready yet—but that’s the point. And this is excellent news for your post-workout primping routine. “It’s supposed to be a little slept in, a little lived in—like a rock ‘n’ roll girl,” one of the hair stylists tells me. To achieve this, plenty of gel was run through the strands to slick it back, and a blow dryer was used over the top to get it flat. 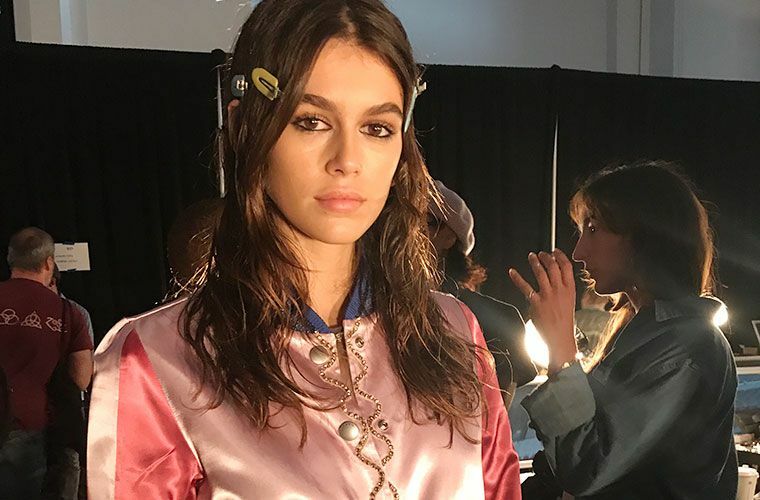 If your hair happens to get a wave to it or some curls when it’s wet, all the better—the models embraced whatever their strands naturally did. On top of the perfectly messy locks, multicolored barrettes clipped in for a rather interesting upgrade on the look. Hey, all I know is it’s certainly easy to replicate when you’re running out of the gym and need to get your sweaty hair out of your face (am I right?). To further streamline your post-workout routine, here’s how to skip a shower and still smell great. And these are the post-gym style hacks Nina Dobrev swears by.